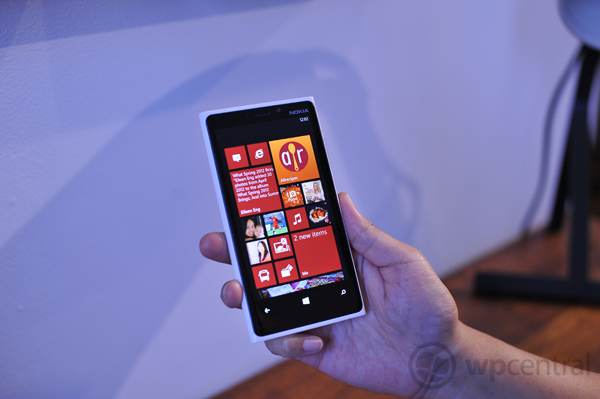 The Nokia Lumia 920 has more tricks up its sleeve, according to a report by SlashGear. If their sources are correct, the Lumia 920 may well be sporting high quality Rich Recording microphones to compliment the PureMotion HD+ display and PureView camera technologies. PureSound, anyone? Rich Recording is a broad-frequency sound capturing system that featured on the Nokia 808 PureView running Symbian. Nokia failed to mention such functionality inside the Lumia 920 on Wednesday's announcement, and the official specification sheet is of no help - though we have seen mistakes made on these in the past. According to SlashGear, the Windows Phone sports a trio of special microphones Nokia co-developed for Rich Recording. What does this mean for consumers? The 'High Amplitude Audio Capture' (or HAAC for short) microphones are able to record a broader range of frequencies than standard microphones. HAAC microphones reach 140 dB, which is a significant increase against traditional microphones. This leads to clearer audio being recorded with less distortion. "To cope with high sound pressure levels, Nokia has developed together with microphone suppliers a new microphone concept (High Amplitude Audio Capture) that can capture high sound pressure levels with perceptually no distortion to the audio. It is capable of recording up to 140 dB and higher Sound Pressure Levels, while that commonly used digital microphones can only reach 120 dBSPL without heavy distortion. As high amplitude audio levels are tolerated, there is no need to limit the frequency response. Hence full audio bandwidth to match to human hearing capabilities can be provided when capturing with HAAC microphones"
The end result is less distortion in recorded audio that is present in most common camcorder functionality. SlashGear further notes that Rich Recording itself isn't mentioned by name in the data sheets they've received, but key software specifications reportedly match those of the 808 PureView.